Over 50 degrees outside in January? I’ll take it! But, the kids want to play in the snow and build snowmen, so we made indoor snowmen in our kitchen. 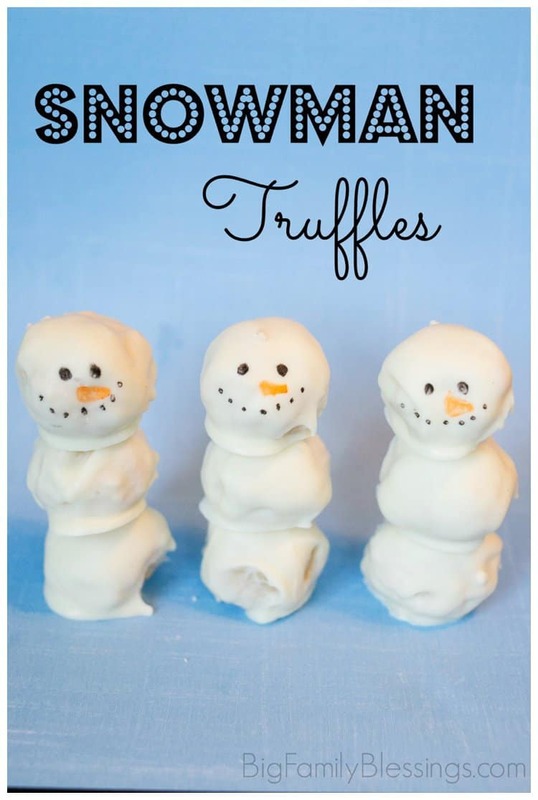 Yummy Snowman Truffles to be exact. Crush the Golden Oreos into small crumbs. If you have a food processor or salad shooter this step is fast and easy. 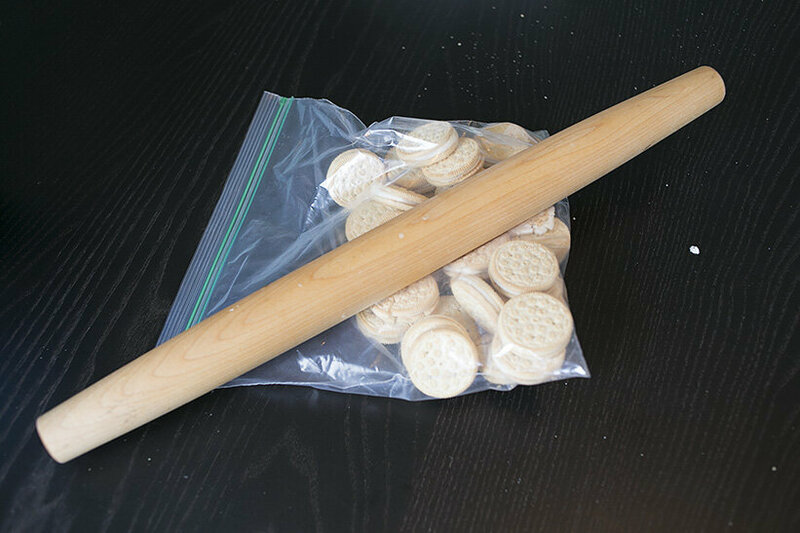 In our house we put the cookies in a gallon zipper bag and crush with a wooden rolling-pin. Takes more time, but the kids think it is fun! In a large bowl mix the softened cream cheese and Oreos using a mixer. Next melt your chocolate according to the package directions. Roll the Oreo mixture into 1 inch balls, dip them in the melted chocolate, and lay the dipped balls on wax paper to cool. Stick one toothpick through the middle ball and up through the snowman’s head. Don’t stick it so far through that it comes out of the top, only go about half way into the snowman’s head. Next stick another toothpick through the bottom of the snowman, and up through the middle ball. Crush the Golden Oreos into crumbs. In a large box mix golden Oreos and room temperature cream cheese together. Roll cream cheese Oreo mixture into one inch balls. 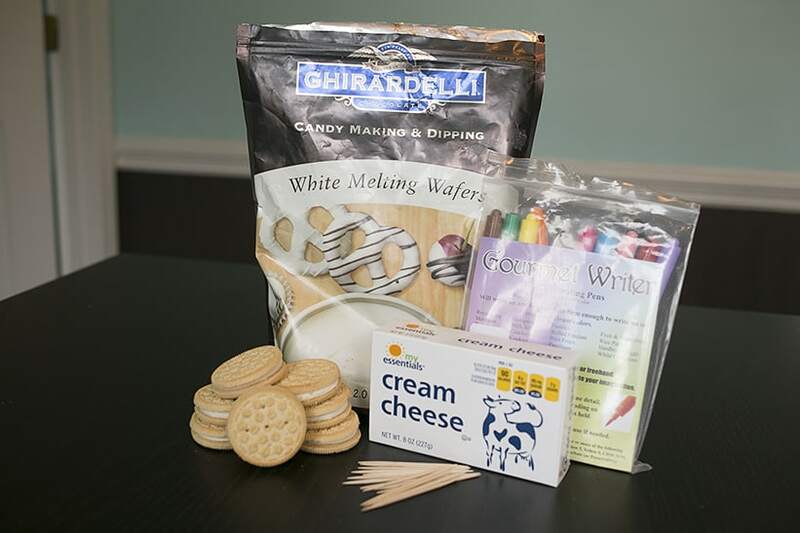 Dip balls into melted white chocolate and lay on wax paper to cool. 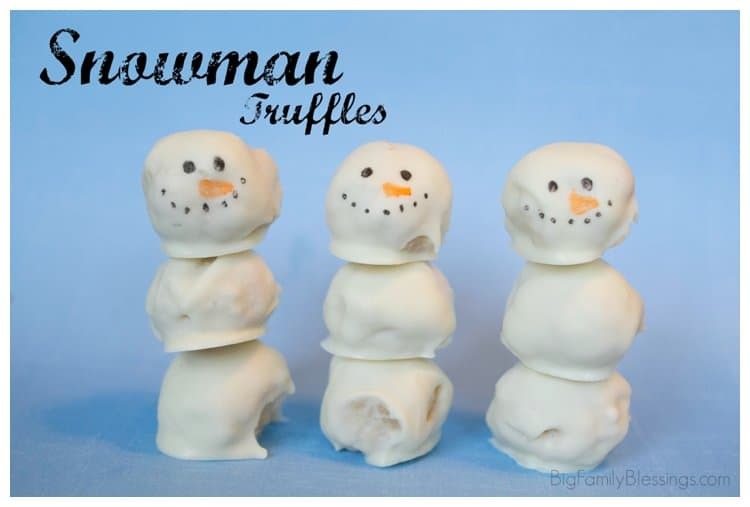 After the chocolate has cooled, draw snowman features on to the chocolate balls. 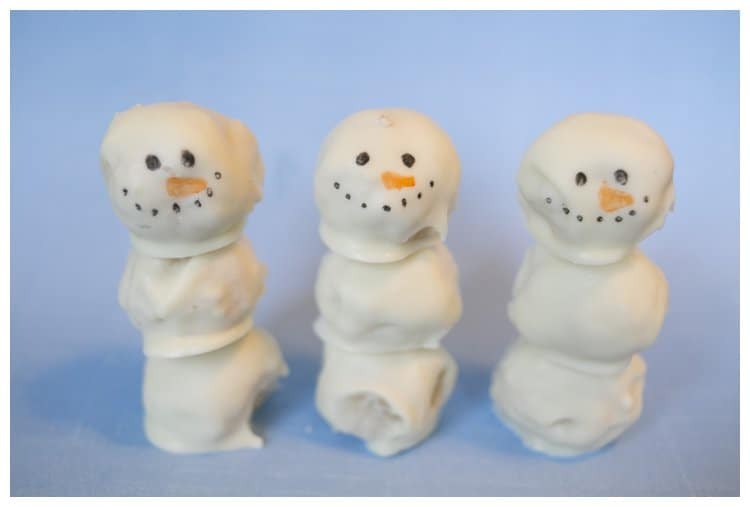 Using 2 toothpicks per snowman, attach the 3 chocolate balls to make a snowman. Stick one toothpick through the bottom and middle pieces, and the other through the face and middle. What!!! This look awesome, have you tried any of the new flavors of Oreo cookies? Thank you for sharing and linking up with us at the #WWDParty. Have a great week. We love double stuff and golden oreos here! I'm afraid to try any of the new flavors for fear of becoming addicted or eating the whole package in one sitting! Too cute and love the easy recipe! Can't wait to try! Featuring you at this weekend's party! Thanks for sharing on Sunday FUNday! Uh oh! Those look too easy. I'm not very good at resisting temptation. How did you like the Ghiradelli candy? I usually buy Merckens, but am a devout fan of Ghiradelli in our chocolate chip cookies. Maybe I'll give it a try next time. I love the Ghirardelli melting chocolates! I've tried just regular white chocolate bark, but the truffles just didn't taste nearly as good. I definitely splurge on Ghirardelli whenever I'm dipping things in chocolate! Dipping things in white chocolate is always a winner! These look yummy.